Lösgodis. The best thing about going to the store. Chewy candy. Hard candy. Soft candy. Licorice flavored, sour, and often times fruity. There is nothing quite like Swedish godis – candy. It is, by far, the best thing about going to the grocery store. It’s another thing that makes someone #TrulySwedish. Where I grew up, the grocery stores had all sorts of cool candy. Reese’s Peanut Butter Cups, Now & Laters, Starburst, Skittles, Mambo, Snickers, Sugar Daddies, Twix… Of course, they also had the aisle of candy where you can take a scoop and pick as much or as little as you want. But that candy was awful – it was either too sweet or too sticky, and never really gave me the kick I was looking for. There is a store called the Sweet Factory at most suburban malls. The concept was pretty similar – go in, scoop what you want, and pay only for what you want. The problem was that you had to make a special trip to the mall, and the candy was so expensive that you only bought it on special occasions or when you felt like splurging. The candy was decent, but I only liked the peach and green apple rings since they were chewy and tangy – just like most of the godis here! Fast forward to 2007 in Stockholm, Sweden. Lösgodis EVERYWHERE. 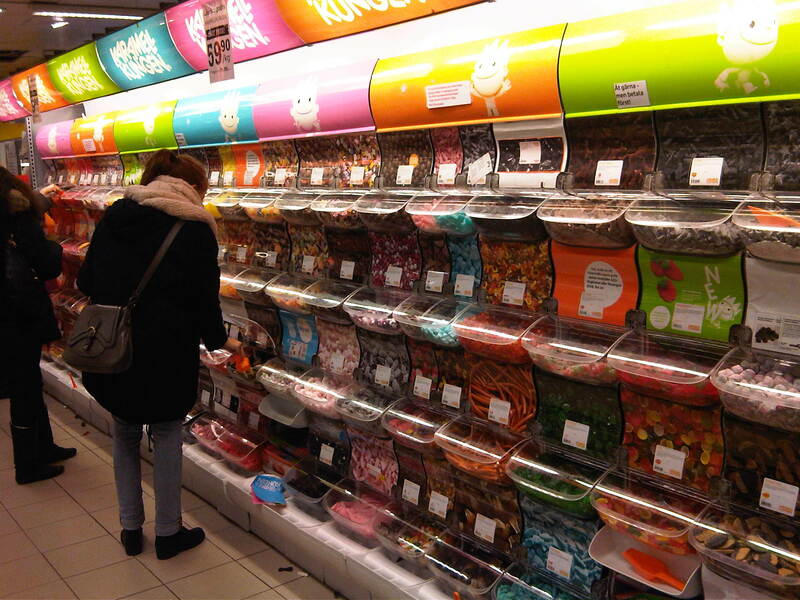 You go to any supermarket worth its weight in godis and you will find a wide variety of candy to pick from. All so colorful, chewy, so fresh (most of the time), and just plain addictive. Whenever they run their sales (39,98 SEK per kilo, anyone?) I make sure to stock up. Not only that, but I see dozens of people stocking up too. You almost always see someone in the godis aisle at the supermarket. Yesterday (Saturday), I went to Fältöversten to get my shoes fixed. At each entrance, an employee gave out bags of godis to each kid that came into the mall. Lördags godis – another #TrulySwedish tradition. What is it about the Swedish candy that makes it so damn good? I haven’t figured it out, but I know I’m not the only one. My mom came to visit me in September, and she took home 5 kg of godis. Yes, 5 kg. That’s how much she liked it. And that’s only to tide her over until I go home next… then she’ll expect me to bring another 2 or 3 kg with me. I also think there must be a conspiracy between the dentists and the candy makers. I haven’t had a single cavity since I was 7 years old, but as soon as I moved here, I had three cavities within a year. For the record, I love licorice flavored candy now. I am #TrulySwedish, after all. Now excuse me while I run to the store to get some godis. This entry was posted in Candy, Culture, Godis, TrulySwedish on November 21, 2010 by Kenneth Chen. I’m sorry to say this- it’s not a magic ingredient that makes the candy so good, as I understand it’s a chemical that tells your brain you need more, so probably not the taste after all ;).. But damn it’s addictive, especially licorice! can you bring back some haribo goldbears too? they just taste so much better coming from sweden! thanks!